ST. PETERSBURG, Fla. — The numbers are shocking, both for Jon Lester and the rotation he heads. So this is what general manager Theo Epstein had in mind. Even against the Rays, a team that has scored the third-most runs in baseball on its way to compiling the best record in the majors, the dominance of Red Sox starters continued in a 2-0 blanking of the Rays last night at Tropicana Field. Over the last seven games, Sox starters have a 1.44 ERA. Over the last four, they’ve been even better, with just one earned run allowed, total, among Daisuke Matsuzaka, Tim Wakefield, Clay Buchholz, and Lester. Even though Lester was hardly his best, not even close, he threw six scoreless innings. 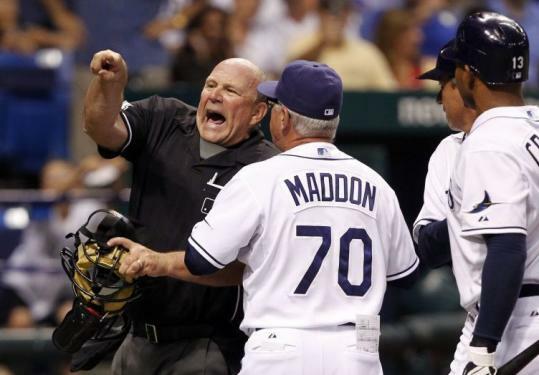 He was off his game enough to walk five batters, even on a night when the strike zone was wide enough to prompt a nose-to-nose confrontation between plate umpire Bob Davidson and Rays left fielder Carl Crawford, and then another heated argument between Davidson and Rays manager Joe Maddon, both of which re sulted in ejections. Lester kept Tampa Bay off the board, allowing just one single to Willy Aybar. It was his fifth win in his last six starts, and he is unbeaten over his last seven starts, going 5-0 with a 1.45 ERA with 58 strikeouts in 49 2/3 innings. The Sox have won seven of eight, against such contenders as the Yankees, Twins, Phillies, and Rays, reversing their deep early-season slump. And they got just enough offense, courtesy of a two-run double from the suddenly bubbly Big Papi in the third. David Ortiz stepped to the plate with two outs and two on, J.D. Drew having singled and Kevin Youkilis having walked. He ripped one to left-center, scoring both runners. After Ortiz’s double, the fourth hit of the game, Shields set down the next 16 batters. The Rays were hardly doing better against Lester. The game ended as a combined one-hitter, with Manny Delcarmen, Daniel Bard, and Jonathan Papelbon each submitting a scoreless inning, as the Sox guaranteed themselves a series win. It was especially impressive given that the Rays were a major league-best 15-5 in games in which the opposing team started a lefthander, and 10-1 in their last 11 games against a lefty, the one loss the perfect game by Dallas Braden. Make that 10-2. “It’s obviously good,’’ said Varitek, who has now caught consecutive one-hitters. “But that’s what we were missing for a period of time. I think it’s a matter of time before that consistently takes over. Even with the walks, Lester still didn’t allow a man to reach third after Jason Bartlett (who walked three times) got that far with two outs in the first. He was stranded, and the Rays never got that close again. The win means the Sox have gone 8-4 during a stretch that could have badly damaged their playoff hopes. The team has crept ever-closer to the Yankees and Blue Jays, currently below the Rays in the American League East standings. The starters have certainly done that. It’s not a pace they can continue for the rest of the season. But it’s heartening that a rotation put together to dominate opponents on a regular basis can, in fact, dominate opponents on a regular basis.